William Chilufya is a civil society advocate with a background in international development and poverty reduction. As a child growing up in the Central Province of Zambia, he remembers how children at school were divided according to their school performance and how children with difficulties were made fun of. William started becoming passionate about nutrition around 2010. This was when he became aware of the 1,000 days window of opportunity and the importance of good nutrition to improve the cognitive development of children. At that time, political will in Zambia to address malnutrition was very weak and there was no civil society voice for nutrition. 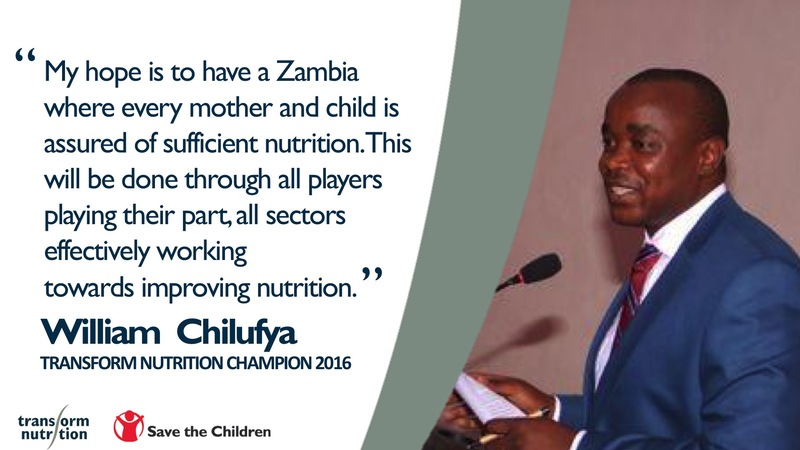 Learn about the 2013 Transform Nutrition Champions Luis Enrique Monterroso of Guatemala, Banda Ndiaye of Senegal and Terry Wefwafwa of Kenya. In the video below, Nick Nisbett (Institute of Development Studies) and Marie Rumsby (Save the Children) discuss the Transform Nutrition Champions 2016 initiative.